The best apps for serious coffee lovers. The Angels' Cup coffee app, on mobile and on your desktop. Just a few years ago there was no such things as a coffee app. And truth be told, you don’t need an app to enjoy a good cup of coffee. But the right app can certainly help you find coffee, buy coffee, and learn to better appreciate coffee. And we’ll look at apps that cover each of those bases. One group of apps that don’t interest me are the ones that are simply instructional, without helping you DO something. These are typically lists of recipes or instructions on how to make various coffee drinks like cappuccino, latte and the like. These aren’t really apps at all. They are simply mini-sites for mobile. The best apps are contextual in some way. That is to say, they help with a task that relates to where you are and what you’re doing. The Starbucks app enables you to find a local Starbucks, Shake to Pay at the till, digitally tip your barista, earn Stars and redeem rewards and – in some cities – it allows you to order your drink ahead of arriving at the store. The Dunkin’ Donuts app does much the same. One extra function it offers is that you can use the app to buy virtual DD Cards and send them to your friends as gifts. Outside of the big chains, there are other apps that support independent coffee shops. Find Me Coffee is a pretty simple app that shows you where to find a coffee shop that is close to your location. And when you try new coffee shops you can write reviews. Those are all fairly obvious uses for coffee apps. But some people are using a little more imagination when it comes to adding value to a coffee lover’s day. 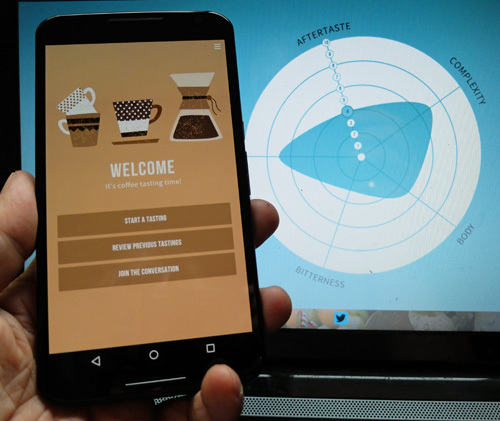 The Angels’ Cup App is a coffee tasting app. It helps you refine your “cupping” skills and really understand the varying taste profiles of different coffees. You can use the app for any coffees you like. But when you use it to record your taste impressions of one of the coffees Angels’ Cup sells, you also get to compare your tasting notes with the roastmaster who roasted the coffee. The CUPS app connects coffee drinkers with independent cafes. What makes it unique is that it’s a subscription service. You choose and pay for a monthly subscription and are then able to use your mobile phone to buy coffees from any of the participating coffee shops...at a discount of up to 40%. One of their payment plans buys you unlimited coffee from every coffee shop in the network. A perfect plan for the serious caffeine addict. For now it’s available only in New York City. But the developers have plans to extend the service to other cities soon. Share your own coffee apps with us. If you use a coffee app, and really like it, please let us know through our Contact page. If it looks like something out readers would like to hear about we’ll list it on this page.